It’s been just over a year since I took notice of an incredible initiative to raise funds for the kids at Children’s Hospital of Pittsburgh that was being headed by a blogger named Elliot Mast. I soon came to realize that Elliot Mast was merely a 12-year-old kid whose ambition and passion for helping superseded his age. Elliot was on a mission in 2010 to raise $5000 by the new year for the kids at CHP, because he was once one of those kids who needed help. A year later Elliot is back at it and is determined to do it again. 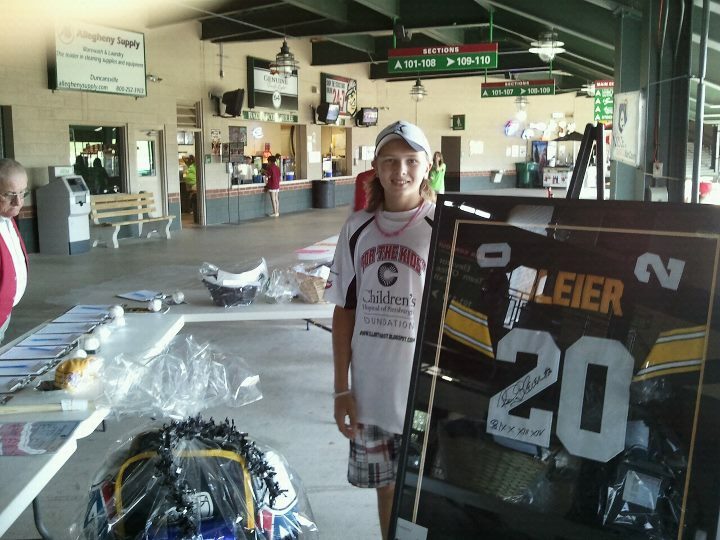 With a summer of raising funds through his baseball playing and a successful silent auction, Elliot has surpassed the $3000 mark and is on his way to another successful fundraising season. Please be sure to follow Elliot on Twitter , share his tweets and urge your networks to share and donate as well. There are only about 45 days left for Elliot to meet his fundraising goal, but with our help he will reach it in time. You can learn more about Elliot Mast and his awesome initiative at Elliot’s Cool Blog. I had the opportunity to meet up with Elliot and his father Don Mast at Penn State Dance Marathon (THON) 2011. This is an incredible kid with an incredible understanding of what it means give back to those who helped you along the way. Aside from being a passionate philanthropist, Elliot is a big major league baseball fan and has interviewed some of the top figures in the game. (Tony LaRussa, Andy Petite and Stephen Strasburg just to name a few.) Thank you for all that you do for the kids Elliot. FTK All The Way! At the start of the month I was prompted to donate my face to No Shave Movember by members of the media group I am interning with. No Shave Movember is a facial hair growing campaign in which individuals raise vital funds and awareness for men’s health, specifically prostate cancer and other cancers that affect men. We are nearly half way through No Shave Movember and the staches are looking healthy. Our team is steadily raising funds, but still need your help. This is my call to action to you to help BMG Staches raise funds that will benefit the Prostate Cancer Foundation, LIVESTRONG, and the Movember Foundation. Thank you in advance for your participation and generosity. Here’s to a healthy future!